Adding some weights, so I’m getting ready for my final heavy light trainingsession for the Master Classic Powerlifting Nationals….. This training felt better than the trainingsession from Wednesday. When I compete for the Master Classic Powerlifting Nationals, I’ll have one heavy light trainingsession left…. Therefore I did the same as Wednesday only with ‘heavier’ weights and less reps…. Just to set myself up for that training …. tomorrow or the day after tomorrow.. Trainingsession took me 45 minutes. Wobbly squats, bench press and chain deadlifts…. Yesterday evening the neurologist called me and informed me about the results of the MRI-scan. My brains and everything around it looks ok. The part, where the operation has taken place, recovered very well. There is no damage nor are there any blood clots. This is very good news for me 🙂 Coming Mondayafternoon the results of the neuro psychology test will be discussed. Hopefully I’ll get some advice to recover my short memory 🙂 Sleeptest will be (hopefully) within 4 weeks….. After that I have an appointment with the neurologist and he will show me the MRI (and I will get it on CD). Then we will discuss the results of my sleeptest. Maybe they can explain what the reason is that my sleeping routine is so unbalanced. If not how it can be solved…. Today’s training was tougher than the past few weeks are going…. My mental energy is much better and therefor I do more ‘normal’ things/work. I skipped the siëstas, so my body / muscles get less rest. So in my opinion it makes sence that the training is tougher than the previous weeks. I took a little bit more time, completing this training in 65 rock solid minutes. ONE word TWO syllables……keep on reading….. Yesterday Wim took me for another equipped ride. After the first equipped session I was a little bit nervous to follow up to this second one, but all I can say is “I buckled my seatbelt”. This for sure is gonna be a bumpy ride! Pjotr van den Hoek (Netherlands strongest pwrlftr in the -105KG weightclass) was so kind to send Wim the Titan suits needed for this training. Some already worn by him. So I thought I was in the clear. I’m learning, slow that is, but I’m getting the hang of at least maintaining the mindset of approaching the bar with a positive attitude. Eventhough I am in pain. Unracking the bar needs more practice and patience. I’m used to taking big steps. With this kind of lifting that is not (yet) possible or practical. Every misstep gets me out of the flow and makes me feel the weights inmediately. With the risk of getting out of the groove. Benchpress *fried* my arms for sure. We tried different shirts but we are still figuring out what shirt works best for me. Let’s say I’m like an “IKEA closet”!! There is always something wrong, missing and the manual is never right. Deadlifts were a blast. I got several ques on my handplacement, stance and tips on how to use the momentum by speeding up the lift. The suit felt great and is for now the right size. 175KG feels like 100kg. My legs and arms were tired from all the other stuff we had done and tried out. The day after all I can say is: ONE word TWO syllables = MUSCLE-PAIN…! Lucky for me the company Perfect Body is helping me out with that. They are so kind to sponsor my supplements and make sure my vitamine and mineral intake is ON POINT. I can’t express how happy I’m with such a generous act. Thank you Perfect Body for making this powerlifting ride (a little) easier. I’ll keep my act together and make sure I wont let you down. therefore I skipped my afternoon sleeping session 🙂 And I’m still feeling much better than the week before, with less physical rest. I also adjusted my foodprogram and wanted to become under the 120kg. Combine this and the results, with less physical energy (real power) and that is ok. Mentally feeling much better gives me a lot of joy. The physical strength will come back in the coming weeks, when my body is used to it. Hopefully the sleeptest will make a next step in my personal health. My midnigth sleep pattern is really worse and feeling so much better is really awesome 🙂 During training I took a bit more time between the sets and thus this training took me 90 minutes. 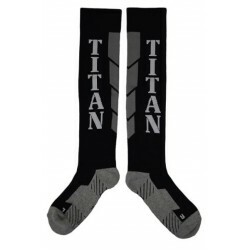 Today I worn my Titan Compression socks, fits really great, click here for more information.